John Leeke’s handbook of window restoration contains detailed step-by-step procedures – along with numerous diagrams of historic window construction and details. 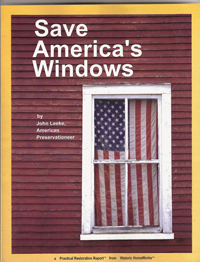 Clem Labine, founder of Old-House Journal, Traditional Building and Period Homes, writes about Save America’s Windows, in his blog over at Traditional Building. Clem says, “Leeke assumes no prior knowledge, so the book can be used both by ambitious do-it-yourselfers and professionals who need to get up to speed on historic wood windows.” Read it all right over at the Traditional Building website.